Vitex, which also goes by the names of Agnus Castus, Chaste Tree, Chasteberry, or Monk’s Pepper, is a flowering plant that is known for its medicinal purposes. Previously Vitex, also known as Chasteberry, has been used to help women cope with the unpleasant symptoms of PMS, polycystic ovarian syndrome and uterine fibroids among other things. However, recently women have reported that Vitex Agnus Castus has helped to relieve the unpleasant signs and symptoms of menopause. The leaves, flowers, and berries from Vitex Agnus Castus can all work as herbal medicines, although the berries are considered to have the strongest affect on the body. Despite the fact that Vitex Agnus Castus is not a well known plant there have been scientific studies in recent years that have shown the positive effects of Vitex Agnus Castus on pre-menstrual syndrome (PMS). 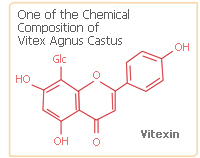 Read below to discover more about what is Vitex Agnus Castus and how it works. Vitex Agnus Castus, also commonly called Chasteberry, grows in the warmest regions of the Mediterranean, where it has plenty of sunshine to develop. The leaves, flowers and berries are all edible and in these regions Vitex Agnus Castus is often eaten to help with different medical problems. However despite its benefits in helping women overcome different diseases caused by hormonal imbalance Vitex Agnus Castus is not a commonly known plant. Nevertheless the reputation of Vitex Agnus Castus is growing in the international community and more women are beginning to take Vitex Agnus Castus, also known as Chaste Tress Berry, to help with their adverse menopausal signs and symptoms. Vitex Agnus Castus, or Chaste Tree Berries, works by affecting the behavior of the pituitary gland. Different compounds that are contained in Agnus Castus Vitex, or Chasteberry, influence the secretion of hormones from the glands, which is how Chaste Tree, Vitex, can assist women suffering from PMS. These different names all refer to the same Vitex plant. The names Chaste Berry and Monk's Perry originate in the old use of Vitex Agnus Castus. Monks used to drink the juice of Chaste Tree Berries because they believed it would suppress their libido, and help them to remain celibate. However despite the different names women should ensure they do not confuse Vitex Agnus Castus with Vitex Trifolia. The latter is a tree that grows along the coastline of tropical east Africa, the leaves of which are used as an insect, specifically mosquitoes, repellant. Although scientists have not positively identified the way that the pituitary gland is controlled they have a theory about how Vitex Agnus Castus, or Chasteberry tree, works. Scientists have hypothesized that these compounds connect themselves to the protein opiate receptors, which travel to the brain and give pain relief. This is why vitex Agnus Castus is particularly effective at helping women to overcome the unpleasant signs and symptoms of hormonal imbalance. Vitex is a flowering plant that grows in the warm, sub tropical areas of the Mediterranean region. In the heat of the sunshine Vitex, also called Chasteberry Tree, grows naturally and is eaten by many of the locals in these areas. However in recent years Vitex trees are beginning to be grown commercially. Farmers in the USA have been growing Agnus Castus Vitex Chasteberry tree to meet the demand of the natural supplement market. The growing demand for more Chaste Berry Tree's has occurred due to the scientific studies that have shown how effective it is at beating the unpleasant signs and symptoms of menopause. 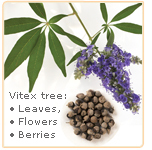 What does Vitex look like? Vitex is a wide green plant that grows to a tall height. With bright purple flowers Vitex Chasteberry tree has small berries that can be picked from the plant to be eaten for medicinal purposes. Scientific studies have shown that Vitex Chasteberry works effectively because of the compounds that are within it. There are a number of different compounds in Agnus Castus Vitex, such as Flavonoids, Alkaloids, Diterpenoids, Vitexin, And Casticin. These compounds work by connecting themselves to the protein opiate receptors in the body. These receptors then travel to the brain where they give relief from pain. Consequently Vitex Agnus Castus is particularly effective at helping women to overcome the unpleasant signs and symptoms of hormonal imbalance. Women can consume Vitex Agnus Castus in a number of different ways. They can make a tonic from the berries or use the leaves as a garnish. However for the majority of women looking to overcome the unpleasant signs and symptoms of menopause, buying the natural supplements may be the easiest thing to do.